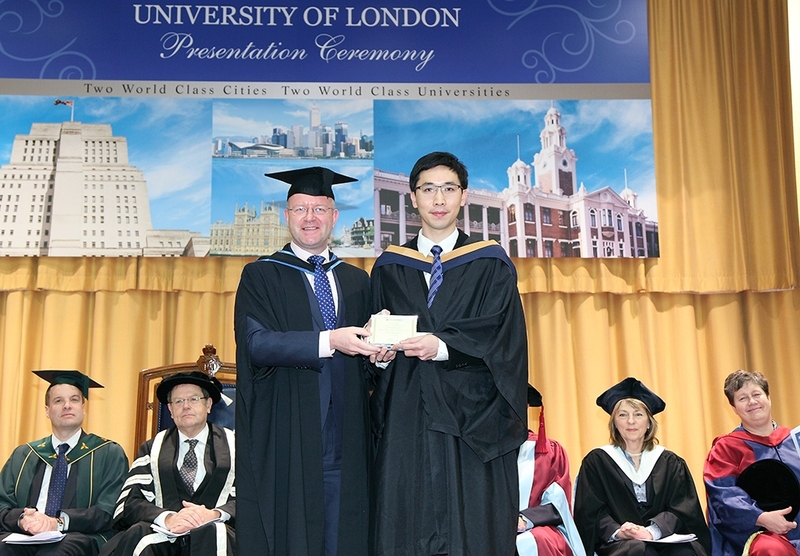 Students from two of the University of London International Programmes’ recognised teaching institutions celebrated their success in Hong Kong last month. In total, more than 70 Undergraduate Laws Programme students attended presentation ceremonies held at Hong Kong School of Professional and Continuing Education (HKU SPACE) and the Polytechnic University of Hong Kong School of Professional Education and Executive Development (POLYU SPEED). Joining the Director of the Undergraduate Laws Programme, Professor Jenny Hamilton, and Deputy Director, Simon Askey in Hong Kong were Professor Jonathan Kydd, Dean of the University of London International Programmes, and Andrew Bollington, Chief Operating Officer. Speaking at the ceremonies, Professor Kydd said: “Today is a celebration of those graduating. Being a student these days involves far more pressure than was the case a generation or two ago. I admire you all for the efforts you’ve made and I celebrate your success with you. From academics and staff at the Undergraduate Laws Programme, we congratulate students from HKU SPACE and POLYU SPEED on their achievements! Previous Post: Bangladesh Convocation – book now!